Harry Burton‘s 2007 film Working with Pinter is a unique documentary about a unique writer. Achieving unprecedented access to Harold Pinter working with actors, the film captures his collaborative spirit and offers a remarkable insight into his writing. 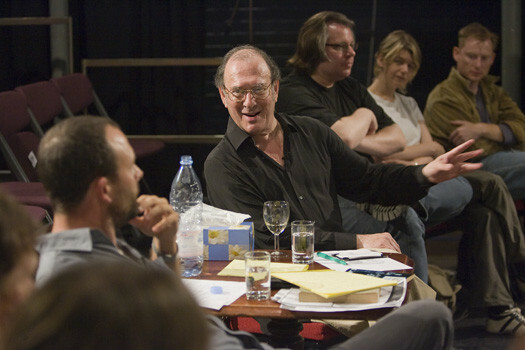 Participating in a masterclass in 2005, the playwright contributes to the rehearsal of extracts from his own plays offering a rare insight into his creative processes. Complementing this revealing footage is an interview with Harold Pinter speaking with his friend and theatrical ally Henry Woolf, as well as liberal quotations from film and television productions of his plays. For nearly fifty years until his death in December 2008, Harold Pinter was at the centre of British and international theatre. It is difficult to over-estimate the impact of his writing. His contribution to British film is also fundamental, including scripts for The Servant, The Go Between and the The French Lieutenant’s Woman. Harold Pinter was known too as a vociferous and uncompromising political activist. In late 2005 he was awarded the Nobel Prize in Literature and his acceptance speech is an excoriating attack on the foreign policy of a “brutal, ruthless and scornful” United States. Accompanying Working with Pinter on this DVD is an in-depth filmed interview with the playwright, including previously unseen material that explores his views on acting, on directing and on writing. Together, the two films express the essence of Harold Pinter as a supremely human writer, actor, political activist and intellectual.